ASP-52410 ASP52410 Asp F-21 Baton Chrome. 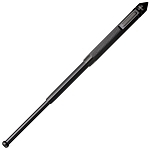 20"
ASP-52412 ASP52412 Asp F-21 Baton Airweight. 20"
ASP-52610 ASP52610 Asp F-26 Baton Chrome. 25 1/2"
ASP-52611 ASP52611 Asp F-26 Baton Black Chrome. ASP-52612 ASP52612 Asp F-26 Baton Airweight.